The weather we have been having down here lately has been horrible. It's been cold, wet, and more cold. I know 40 degrees doesn't seem like it's very cold to many, but when it's a rainy wet cold it's horrible. Our poor horses are all freezing. My thoroughbred mare shivers when it's this cold. So, Mr. Cowboy has been working all morning in the slush and nastiness moving weanlings around and getting hay to the horses. 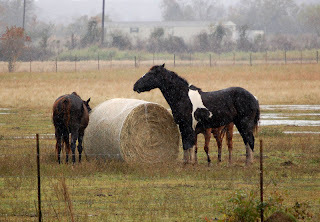 He had moved the two babies and was taking their round bale out of the pasture and giving it to Ozzie. 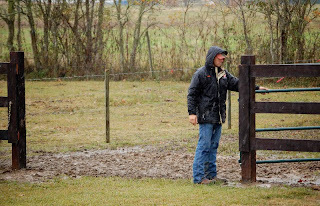 He wanted me to come out and hold the gate! Uhm....NO!! He is wearing my warm winter jacket! No way am I going out in that slush with out a jacket! I was glad he got it all figured out! Then he moved a big round bale out for the mares and two geldings in the big pasture. It started out with just three horses there. Which isn't too bad. You can tell who the boss is right? Ha ha ha!! My Pearl girl is the queen out there. Not even HUGE Prince will go near her. I am glad she is such a bossy woman, because she needs the hay the most. I worry about her. She never gets as hairy as a coat as the other horses. She also has very sensitive skin. I have to use a curry mitt when I groom her. 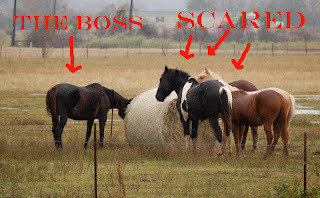 But I thought that pictures up there shows how much the other horses respect my girl. 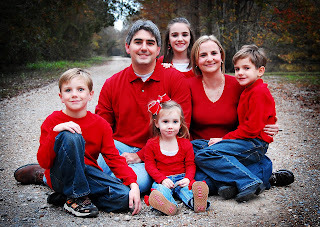 But yesterday, before the weather turned to gloom and doom, I got the chance to do a family photo shoot! The mom and I are good friends. She needed a picture for her Mom's Christmas Present. I was happy to try to get one. I thought that one would have been perfect!! That's how life is right? Ha ha ha!! But here is the good one. A family picture is never good enough until you have a little Joe in it! I actually wish I had put their oldest girl in the spot that Joe is in. Next time, I will do better with seeing the whole picture. 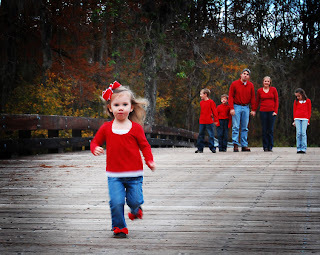 It was my first family shoot. The kids did great! Hope everyone is staying warmer than we are!! you did great on the photo shoot. 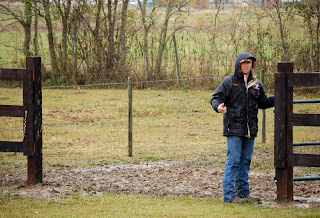 I can relate to the cold wet yucky weather! Andrea!!!! 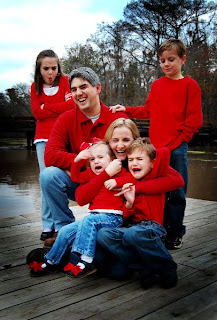 How funny, I was just thinking of calling you tonight about making our family picture for Christmas!! What do you think? What do you charge? When would be a good time for you? I am so excited....Laura's look wonderful. Great shot. You did good! 40 degrees is cold, eh? How 'bout you come here to New Mexico, ok? Last night we didn't even get above 10 degrees! We are NOT getting warmer weather here! It's been frosty and cold! Maybe some snowflakes in our future. Nothing major though....which is good, I need to take care of my horse this weekend so I need to be able to get around. Stay warm and tell that hubby to get his own coat, lol! Stay dry and warm girl!! Photos are excellent! Nice job there!!! I agree - great family portrait! I've been trying to get my sis over here to take a Christmas shot of me, hubby and critters. I think I'd almost rather have snow than the slushy mud and rain weather. But I'll get back to you on that as we're supposed to have our first storm today with 3-5 inches. Glad your girl is the boss out there and they respect her. I agree with everyone else, great family portrait. I hear ya about the cold weather! I want my 70s back! It's just miserable. You did good on your family shoot. My parents asked me to take their picture for the Christmas card. I'm so NOT a poised portrait photographer. I think I will stick with cows! Not the Brightest Crayon in the Box!